Manuel Granatiero was born in Naples in 1976. In 1991 he was awarded the third prize at the international prize “MittelEuropa”. He graduated in 1994 earning the same year the “Premier Prix ” with the unanimity of the jury at the “Accademia Italiana del Flauto” with R. Guiot. He continued his studies in modern flute with Alain Marion (Académie de Perfectionnement d’été, Nice), Irena Grafenauer (Mozarteum, Salzburg) and Angelo Persichilli (Accademia di S. Cecilia, Rome). 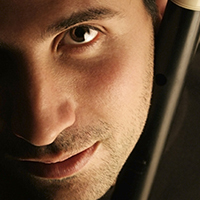 In 1998 he began studying the historical flute with L. Pontecorvo. In 1999 he was admitted to the “Koninklijk Conservatorium ” in Brussels , where he studied baroque and classical flute with Barthold Kuijken , Marc Hantai and Frank Theuns and where he graduated “with distinction” in 2004. He plays with some of the most important orchestras specialized on historical instruments as a soloist and as a first part: Gli Incogniti (A.Beyer), Academia Montis Regalis (A.De Marchi), Accademia Bizantina (O. Dantone), Australian Chamber Orchestra (R.Tognetti), Les Talens Lyriques (C.Rousset), Holland Baroque Society, Ensemble Philidor (Mira Glodeanu), Ensemble Cordia (S.Veggetti), to name a few. Playing with them he had the opportunity to know many important personalities of Ancient Music, and performed on stages all around the world. He has recorded for Deutsche Grammophon, Decca, Naive, Deutsche Harmonia Mundi, Zig Zag Territories, Dinamic, Virgin Classique Atma Classique, Radio 3 and Stradivarius. He currently teaches historical flutes at the Conservatory of Perugia. He is one of the founders of Accademia Ottoboni.